We are sitting in a restaurant eating couscous: my mother, father, sister and I. It’s the mid-Eighties on the Costa del Sol. The Europe of my childhood is forever conjoined to this iconic stretch of coastline chased by the sun and an endless carve-up of tourist development. There are beaches lined with stripy deckchairs, orange sorbets eaten out of actual frozen oranges, and flamenco dolls in ruffled dresses locked into triumphant poses. There is freedom; of movement, youth, and horizons. And heat, the guaranteed kind never felt at home that makes the backs of my legs stick to the chair and beads of sweat tremble on my father’s bald head when he eats too much chilli sauce. Which he always does. We eat here a lot. The restaurant owners welcome us with open arms when we return year after year until life takes a dark turn and in the midst of recession and soaring interest rates our house is repossessed, and there are no more family holidays. For now, we are blessed; a portrait of a happy immigrant family composed of respectable mother and father from south India, two good girls from south-west London, and a dog back home with the nice English ladies who live up the road. We always order the same dishes. Couscous, chicken stew, meatballs, a fragrant broth laden with chick peas, turnips, and carrots. Extra chill sauce that comes in a bowl ceremonially delivered on a saucer. Back home my mother, an expert as all immigrants must be in replicating their cuisines in unfavourable conditions, comes up with her own version of the “Spanish couscous” we all hold in such high regard, and which I now know to be Moroccan. This idiosyncratic Indian-African-Spanish-European mash-up becomes a family staple. It is only in recent years that my mother, now living with incurable breast cancer, has stopped making it. As I write this, my mouth begins to water with nostalgia for childhood, the Europe of my imagination, but most of all that couscous. I think to myself; call her, now, and get the recipe. Before it’s too late. It moves me to picture this brown-skinned family trying to do the right thing. Holidaying on the Costa del Sol like the English. 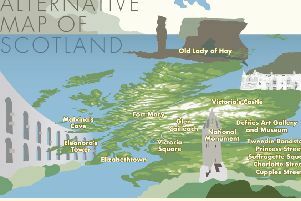 (The Scots have yet to cross my radar: on my own drizzly island I have barely been north of the river Thames, let alone north of the border). Staying in villas with private pools like the English, even though my parents, from land-locked Bangalore, can’t swim. Spending the day on the beach like the English. And coming home with the same souvenirs as the English, like those glossy tiger cowries carved with pictures of fishing villages that for a time colonised many a British mantelpiece. I see a version of Spain that, like those cowries, was never real but is still authentic to me. I see how Indian, English, British, and European I am. Then and now. And recalling that saucer of chilli sauce I see a country where we were welcomed. “I would sooner be a foreigner in Spain than in most countries,” wrote George Orwell. Yet it was in Spain, where my sister and I turned a deeper shade of mahogany, that we somehow ceased to be foreigners. Where we were even on occasion seen as Spanish, a pleasing case of mistaken identity that never befell us in our native Britain. Until we had children of our own, my sister and I continued to holiday in Spain together. We once went to Tarifa and stayed in what was billed as Europe’s southernmost house. An old converted observatory atop a hill looking across the straits of Gibraltar. At night we sat on our terrace whipped by the notorious Tarifa winds and watched the lights of the cars snaking along the roads of Tangier. Africa. Another continent just nine miles away. During the day we lay on the beach, turning ourselves this way and that, appalled by the scores of African migrants forced to attempt the perilous crossing in paddle boats. This was years before Europe’s refugee crisis was described as the worst humanitarian disaster since the Second World War. But it was coming. For these people, it was already here. I live alongside another river. Not the churning expanse of the Thames, nor the industrial artery of the Clyde – where I harboured for a decade in Glasgow during my freewheeling twenties – but the more slender, secretive water of Leith. I have lived north of the border for more than half my life, and have young children and a dog of my own. Though I am not Scottish, I have given birth to Scottishness, twice. It’s no coincidence that Leith, which springs from the river’s mouth and was Scotland’s most important trading port for three centuries, turned out one of the largest Remain results in Edinburgh. Like good coffee and ruined castles, Eurovision and wine (and Leith once exported a staggering million wine bottles a week to France and Spain), Leith simply is European. When I walk to the Sainsbury’s local to pick up a pint of milk I pass Lamb’s House, where Mary, Queen of Scots was entertained by a Hanseatic merchant in the summer of 1561. The Hanseatic League was a northern European trading alliance created in the Middle Ages to protect economic interests. European, then and now. For one reason or another I haven’t left this small, increasingly divided island for six years. To use a loaded word, I have remained. Yet these are the years in which I have felt more European than ever. The paradox of identity is to belong more to places once you have left them. To inhabit your identity most ardently when it is under threat. Perhaps this is why I have always loved being elsewhere. Perhaps I leave in order to remain. In England I am British, which now feels like an oddly antiquated thing to be, and it is only when I cross the border on the endlessly troubled east coast mainline that I become English. Geographically it happens somewhere around Berwick-Upon-Tweed. By the time the train has pulled in to Waverley station the metamorphosis is complete. “It was Edinburgh that bred within me the condition of exiledom,” wrote Muriel Spark, one of the capital’s foremost writers who left when she was 18, died in Italy, but remained in the city that bore her for life via her clipped words and sensibility. She did not regret “the condition of exiledom” bred in Edinburgh. “It has ceased to be a fate. It has become a calling,” she acutely observed. And there is a certain hauteur that still blows through the Athens of the North that makes me feel like more of an outsider, more of an exile, and perhaps more of a writer than I do in other places. Knowing that I will never belong to Edinburgh may be what keeps me here. The Europe of my past was a vague, romantic land of artists, writers, and philosophers. A place to go and drink coffee and smoke cigarettes in pavement cafes, to talk politics and be a little more free. Now, different, more dangerous sparks are lit by the Europe of my imagination. I think of the mass exodus of desperate people through a continent that will not welcome them. The sensual ritual of baking my body on the sand and then cooling it in the clear waters of the Mediterranean has been obliterated by the image of a three-year-old Kurdish boy washed up dead on a beach in Turkey. I fear encountering populism in the places where I once felt at home. I picture myself, my white, Scottish, female partner, and our mixed race children on holiday and fear racism, homophobia, nationalism. Then I remember that couscous on the Costa del Sol and I am welcome again. I am European. I am Indian. I am British. And in Scotland, where for now I remain, I am English. Only one piece of the puzzle is left. I cannot remember the name of the town nor find it online. I text my father. Later I will find out that when he receives my message he is in A&E with my mother, who has been rushed into hospital with hypoglycemia. As I harness memories into sentences, my mother, a retired doctor who worked in the NHS for almost all her adult life, is being tended by medical staff from all over Europe and beyond. I picture my father seeing that message in the midst of deep crisis. Taking the time to tap out a single word with his inexpert, long-nailed thumb. A code that only my family can break. A name that evokes a lifetime of adventures in belonging. Benamara.